Say welcome to the newest additions to Wind Dancer Farm. 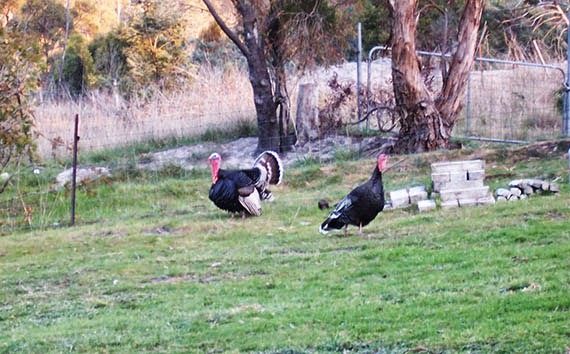 Gobbler is the one with the big tail, for obvious reasons. He’s the noisy one. The other one only makes tiny little whimpering noises so far. We have no idea if the smaller one is a young male or a female. Does anyone know? Can’t name mini-me till we know if its a girl or boy. These guys have been living in the shrubby land between us and the neighbours. We’ve seen and heard them over the last few months but lately they’ve been coming down to our fenceline daily and we’ve been tossing them some feed. So today we let them in. They look quite content. The dogs aren’t sure what to make of them. We rather enjoy a new bird call among all the others. Its funny. We started with the ducks we inherited. Now we get visiting ducks of different breeds, a family of plovers who breed on our land every year, native hens that live here, our dwindling population of chickens (one chook and one rooster at the moment but we’re getting a whole lot from friends who no longer want theirs). We added 3 geese last Christmas and now we have a happy family of six. 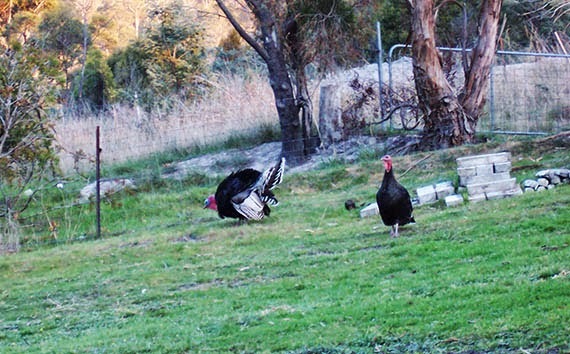 And today we added two turkeys. Anyone who visits us here can’t get any sleep at night cause of all the noise. We’re used to it and love it. We started with one horse. Now we have four. All these mouths to feed, all these chores to do. We also have a huntsman spider living in the letterbox. I’m thinking his name is Harry. He’s welcome to live there now that I know he’s there and he doesn’t surprise me when I put my hand in to get the mail. At least Harry fends for himself. This entry was posted in animals, life on the farm by zefiart. Bookmark the permalink. how rich your life is; to be able to share it with all of these creatures….